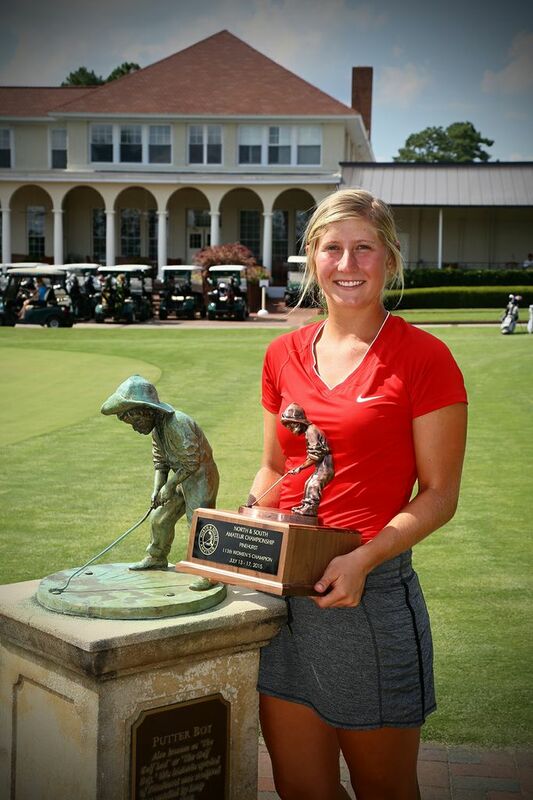 VILLAGE OF PINEHURST, N.C. — Down two holes with two to play Friday in the championship match of the Women’s North and South Amateur, Bailey Tardy needed to dig deep. The incoming Georgia freshman responded, making par on the final two holes while her opponent, Bethany Wu, the top-ranked junior golfer in the world, slipped up just enough to let her back in the match. After the first sudden-death playoff hole, Tardy found enough mental strength to drain a lengthy par putt on the 376-yard par-4 second and put the pressure on Wu, who saw her 5-foot par putt rim out. For the seventh-seeded Tardy, the victory marked an incredible run in match play that saw her defeat last year’s runner-up, Lori Beth Adams (2 and 1), in the quarterfinals, and the 2013 Junior Girl’s North and South Amateur winner, Anna Redding (4 and 2), Friday morning during the semifinals. But the biggest test was the final round against Wu, an incoming freshman at UCLA, who looked unflappable earlier in the day when she defeated the No. 1 seed, Katelyn Dambaugh, 3 and 2. On the front nine the players traded the lead, as Tardy began with a double bogey on the par-4 first and Wu shot back-to-back bogeys on the next two holes. But the players ended up all square going into the back stretch. Tardy shot par the entire back nine, and it was Wu who took the role of aggressor. She landed her approach shots on holes 13 and 16 inside 6 feet, setting up easy birdie putts to establish a two-hole lead. With the match dormie on the par-3 17th, Wu sent her tee shot into the right bunker and couldn’t get up-and-down to save par. On the 366-yard, par-4 18th, Wu left her approach and subsequent pitch shot short before two-putting. The Diamond Bar, Calif., native made a tough up-and-down to keep the playoff alive on the 19th hole, but her putt for par on the 20th was a heartbreaking hair to the left. Despite the loss in the final, Wu’s first experience at Pinehurst demonstrated why she’s one of the top junior golfers in the world. Indeed she did. Wu bogeyed just once in her semifinal match against the tournament stroke-play medalist Dambaugh while rolling in three birdies, winning in 16 holes. Tardy also showed up in the semis. The Norcross, Ga., native defeated the No. 3 seed, Redding, with a stellar three-birdie showing across 16 holes. Redding, a native of Concord, conceded on the 16th green. In the championship, the future Bulldog’s decisive 15-foot putt on the second playoff hole came after a day of not putting well, by her own admission, no less. Tardy will have her name added to an impressive list of Women’s North and South Amateur champions. It includes legends of the game like Babe Zaharias, Louise Suggs, Peggy Kirk Bell, Hollis Stacey, Brandie Burton, Brittany Lang, Morgan Pressel and Yani Tseng. As much as the North and South is a championship with a great past, it also continues to foster a great legacy. Nine of the last 12 Amateur champions have joined the LPGA Tour. Jordan Beck is an intern at The Pilot and a rising senior at North Carolina State University. No. 4 Bethany Wu d. No. 1 Katelyn Dambaugh, 3 & 2. No. 7 Bailey Tardy d. No. 3 Anna Redding, 4 & 2. No. 7 Bailey Tardy d. No. 4 Bethany Wu, 20 holes.